Celebrate our Freedom and show your patriotism with this self striping yarn! Since blue is my favorite color and I naturally gravitate towards blue in my dyeing I wanted to try something new. That’s easier than it sounds. 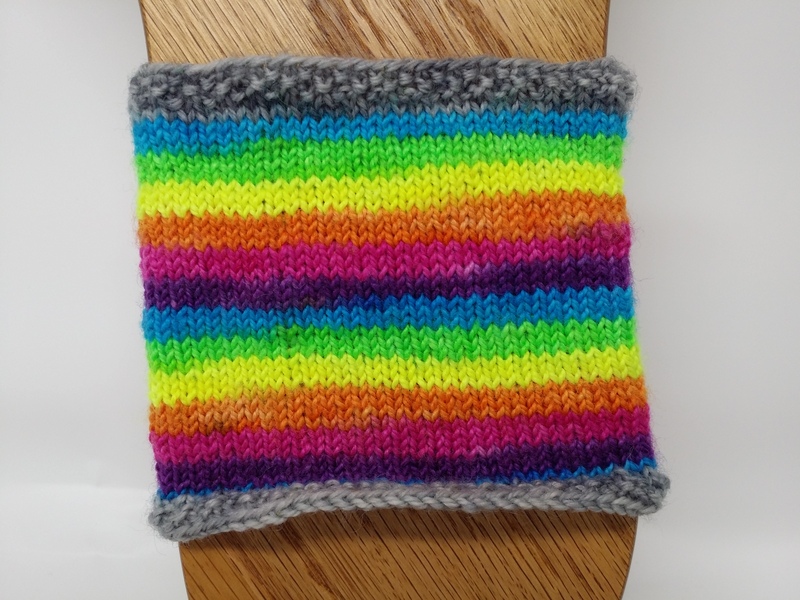 I decided that the love for my young niece’s and nephew and the joy they bring me would be my inspiration and began planning out this colorway. Two nieces are sisters and then there are the twins, a boy & a girl. Using their favorite colors I pulled in pink for the sisters with some black for the baby sisters jet black hair. The green & purple representing the twins had to be equal in width, because I love them all just the same. Hope this colorway brings as much fun in your knitting as my niece’s & nephew bring into my life. Missouri has a glorious history some good, and some bad, The Missouri Outlaw series. Belle Starr was an infamous female outlaw born in Carthage, Missouri well known for cattle rustling and horse theft, she was a true Outlaw Queen. Associated with the James brothers and Younger gang she aided them on many occasions. Even though she got down and dirty in crime, she always maintained a sense of style. She always rode side-saddle, wore a black velvet riding outfit that included a plumed hat and carried herself magnificently. Dressed to the nines we think Belle would have loved sporting a pair of socks in this down and dirty rainbow all speckled in black. Let your own rebel out and relish a little mischief with Belle Starr. This colorway reminds Ginger of her many canoe/float trips. Canoeing the Big Piney River is quite scenic with the dark blue green water, and passing all the beautiful trees that are along the sides of the river. You can also spend time hiking and exploring around this beautiful river. Whatever you decide to do it’s certainly worth the trip! Springfield is home to a variety of places that enjoy tempting us with exquisite confectionery delights, one such glorious place is The Candy House. When you first walk in the door you immediately notice the sweet aroma of sugar and chocolate, your mouth waters and your eyes gleam as you take in all the delectable treats before you. This colorway with its sweet rock candy purple, cotton candy pink and pretty taffy blue brings just the right amount of candy house bliss to your knitting. Chocolate Covered Strawberries: the perfect decadent indulgence for you and your knitting needles! Christa’s little boy Jacob turned 3 in 201 and he is OBSESSED with dinosaurs. One of his favorite shows is Dino Dan on Nickelodeon. In honor of his 3rd birthday and his favorite things Ginger, Ester and Christa present to you Dino Jacob!!! One of Ginger’s favorite outdoor activities is a quiet Float Trip down the river. This colorway is inspired by all the beautiful colors you see as you float down the river: Warm copper and brown for the gorgeous rock formations, the teal blue of the water as it ebbs and flows and the amazing greens of the trees and moss surrounding you. Sit back, relax, and float away with this yarn. Most of us either grew up in the 80’s or had siblings growing up in that time frame. We all were exposed to all the brite neon colors in the girl cartoons, all the clothes including those things we try not to speak of: leg warmers! And I think almost every girl in the 80’s had at least 1 school folder or pencil that was Lisa Frank! Who can forget all those crazy neon colors in unicorns and rainbows! This color way is a homage to all the glorious neon rainbows of our youth! Tammy’s addiction to un-sweet tea with peach means that you can often find her at a Sonic Drive-In between 2-4, which is our favorite happy hour. They claim to be your ultimate drink stop, so what else is better than our summer beverage inspired self-striping yarn? Alternating stripes of Grape Slushie, Frosted Lemonade, and Orange Crush. This colorway has a little bit of everything! We took all the neons and put them together and gave you all we got! Who doesn’t remember the church picnic or end of school party that always included an ice cream social to cap off the glorious summer event. All that delicious ice cream, do you remember the bubble gum and birthday cake ice creams? What about all the toppings, the hot fudge or chocolate syrup and don’t forget the SPRINKLES! This colorway is a sweet homage to all those yummy treats and we promise you won’t have to count calories to enjoy it. Oh hello dearie, did you say you like my shoes? These beautiful Ruby red shoes? Why thank you! Where did I get them? Oh well now that’s a very special story. It involves a tornado, a house and a very nasty witch. Come on and sit a spell and lets knit together and I will give you all the details. It’s Show Me Yarn’s 2nd Birthday and we are celebrating with the way a dyer must: with our favorite colors! While there are really no colors we don’t like we all have a special place in our hearts for blues, and teals. 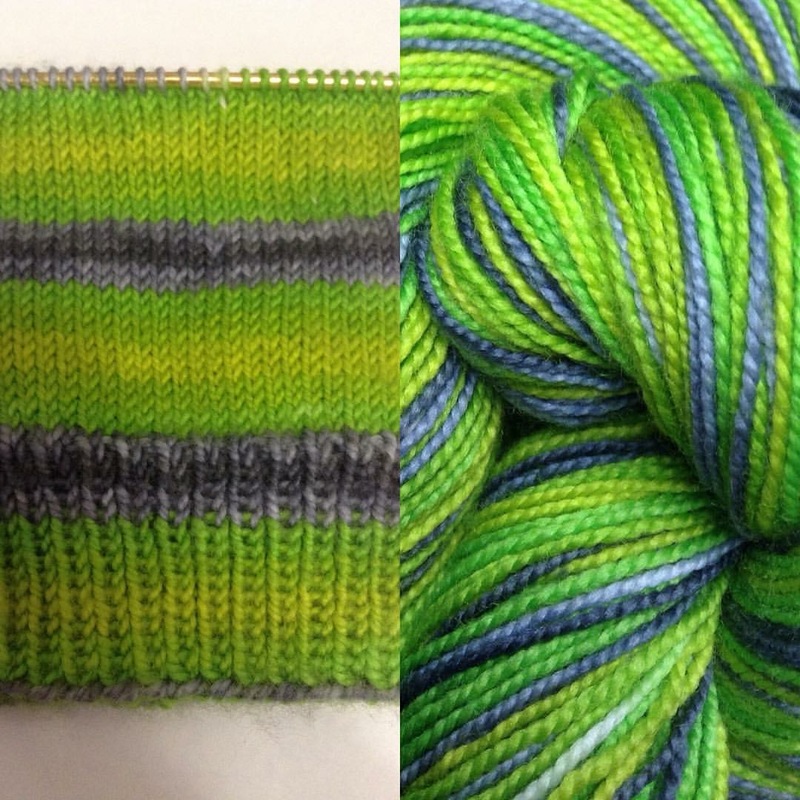 Lots of giggling and smiling happens when the right amount of blue and green hit yarn. It makes us want to sing another song (Favorite things from Sound of Music): Blues in the sky, blues in the ocean, blues in a lake and blues in our wardrobe, wrap them all together and we all will sing: These colors are our favorite things. Who can forget the first time you saw that baby faced Johnny Depp on 21 Jump Street? The young rookie that was way too young to actually be a cop. As we continue to bring back all the things we loved we introduce you to Jump Street. Our homage to a great fast paced cop show and for many of us one of our first crushes! More flash backs! While not all of us grew up during the 70’s when Jungle Boogie was written, the song is so well known and who doesn’t like to boogie now and then. This colorway is far out! So get down with your bad self and knit..you dig? Dyed at the request of an awesome Zombie – we present to you a mash-up of valentine’s Day and St. Patrick’s Day in Kiss Me I’m an Irish Zombie. Every year we swear its going to be different this time! We’re going to start knitting in the summer and be finished with our Christmas knitting before December comes this year! Inevitably we end up knitting and knitting and knitting right up to the last-minute for the people we love for Christmas. In our knitting group, we have a phrase to encourage each other: Knit Little Elf, Knit! It’s that time of year now to get those needles or hooks smokin’ and finish up that knitting list. 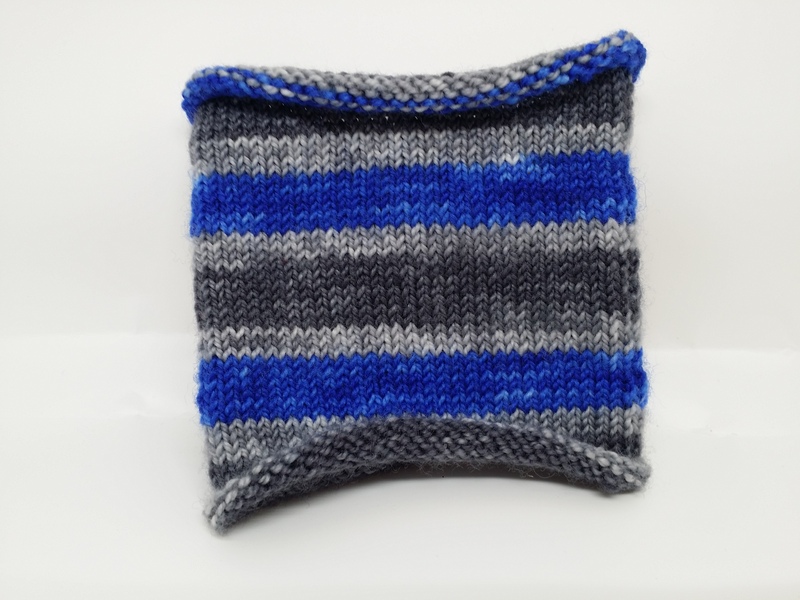 We all have favorite colors and they don’t always seem to match, but just like our mix of knitting friends all those beautiful colors and personalities come together in amazing unexpected ways. This color represents all of the fun and crazy times we have when we get together to knit. Old, young, tall, short, left, right no longer matters we are just friends having a good time sharing something we love. Some of us knit and listen while others tell stories that keep us rolling with laughter. Whether you attend a local knitting group or you knit with your cyber friends the important part is that we all still knit together. To all of our knitting friends past, present and future this is for you. Lula What? What’s this crazy LuLa things about anyway? Buttery soft leggings that feel like your naked only better! What you think leggings aren’t pants? Well let me put that note in the jeans I’m not wearing anymore. You want to be comfy while you knit; put on your leggings and know they are too pants! The 2nd colorway in our Missouri outlaw series pays homage to that infamous, idolized and even copied outlaw couple Bonnie & Clyde. There have been so many movies and books made about this couple, glamorizing their brief rampage across the mid-west including time spent here in Missouri. While the true story isn’t as glamorous as the movies this colorway has the allure and mystique that their romance and life as outlaws appeared to have to everyone else. Frankie, Drac, and all the ghoulies love to trick and treat what a wonderful way to spend Halloween. Our Monster Bash kit showcases these darling monsters out trick or treating (OMG did you see there is a PUG!) 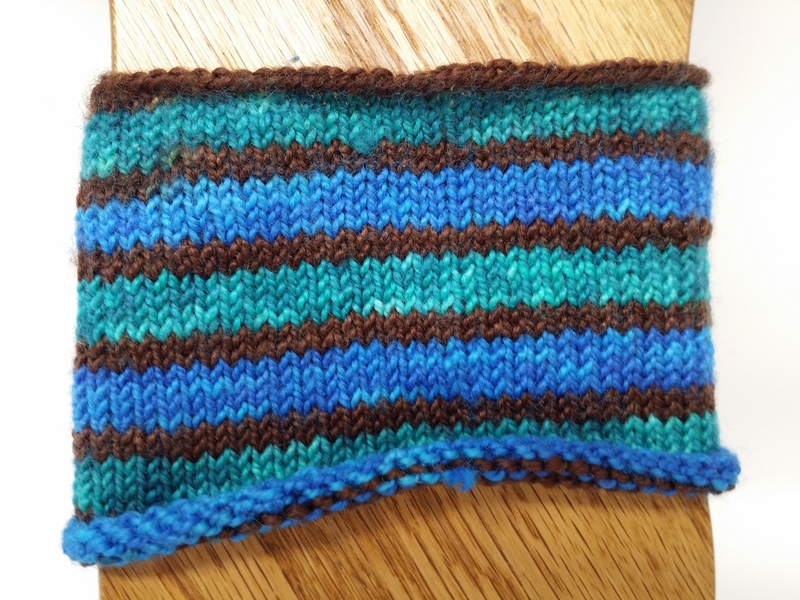 and our self-striping yarn made to coordinate perfectly. So knit up some ghoulishly fun socks and scream with delight from this Halloween treat. Mozarkite is the official Missouri State rock. the pinks and greys in this yarn match perfectly with its name sake. Treat yourself to a unique vacation in Osage Beach, Missouri. Enveloped by the Lake of the Ozarks, this jewel of a locale is the perfect place for a special getaway. Dyed with all the colors you know from the beach, the warm sand, the tranquil blues of the water and that gentle sea-foam green. This colorway will make you want to stretch out on that wooden deck chair, squish your toes in the sand and water and just enjoy the beautiful breeze that comes off the Lake and soak up some sun. Weather you are running away to your favorite beach or enjoying a quiet staycation go ahead and knit yourself a pair of beachy socks. When we saw those awesome blue peeps covered in multicolored sprinkles we knew we had to dye yarn to match. For many people, including us Peeps at Easter are a must have treat. Party Cake Peeps is a celebration on yarn. A celebration of awesome color, and Easter itself! 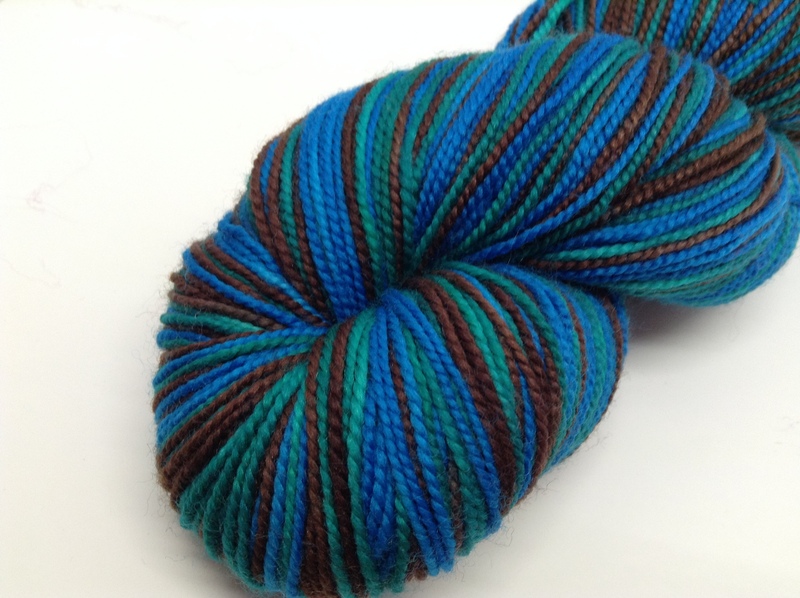 Even if you don’t love those gooey marshmallow treats, we think you’ll love this yarn! big section of speckled peep with 2 small sections of chocolaty brown to represent their eyes and just a little section of that yummy blue all by itself to bring everything together. Pickle Springs, yes there really is such a place, is a beautiful scenic natural area containing all sorts of fascinating sandstone rock formations and wet weather waterfalls. With a wealth of unique plant life including several varieties of moss, lichen, and ferns Pickle Springs is appropriately green and a great place to go trail hiking. This yarn takes its ques from those glorious greens that grow so well in that wet climate, and moves into shades of grey reminiscent of the sandstone and limestone formations you see surrounding the spring and waterfalls. An extra fun fact for naming something pickles is that they just happen to be a favorite food for all three of us – Extra, extra, extra pickles please! With the Olympics occurring in Rio in 2016, it’s the right time to pay homage to Ester’s heritage. Brazil is known the world over for many things, not the least of which is the annual celebration of Carnival. With elaborate, colorful costumes and decorations taking center stage and people partying and dancing the night away who wouldn’t want to join in the celebration. Add to that the Brazilians favorite sport and national obsession – Soccer! When the men’s team won the Olympic gold this year the country exploded in a celebration that rivaled that of Carnival. This colorway in the vibrant colors of the flag is reflective of the fun and excitement of celebrating that big soccer win and the Samba party atmosphere that followed. Fondly named after a very popular restaurant in Ozark, MO near the Finley River. The Riverside Inn was where you went on special occasions with that special someone. Most people will have a story to share with you about an evening at the Riverside Inn. Everyone in the Ozarks was sad in 2009 when they closed for the last time due to one too many floods. This colorway is a homage for a place that is greatly missed and will always be remembered. With glorious yarn popping up smiling eyes are sure to follow along with plans for the next big project. We hope this gorgeous self striping green gradient and its fabled pot o’ gold will make your eyes twinkle with glee and have your needles dancing a jig! May your home always be too small to hold all of your friends…and your stash. Something Wicked is our Halloween Self-Striping. Lots of people are excited that the play Wicked is coming to the area, and this colorway reminds us of all the posters around for it. This colorway is a bit wicked as the greens and greys change from the different shades and plays a few tricks on your eyes. Our love of the 80’s is oozing into everything! In the 80’s television was all about exciting adventures with colors that screamed for you to pay attention. This colorway is a tribute to one of our favorite shows with a logo just as bold as the story line – Miami Vice. Every week you sat captive at the edge of your seat waiting for Don Johnson (Sonny) and his partner Rico Tubbs to come save the day. With this yarn you’ll feel like you’re just a knit stitch away from adventure: it’s Totally Awesome. Here in Tornado Alley, blue skies can quickly turn to grey as severe storms pop up with little notice. We’re grateful for the storm chasers and weather teams that get the alerts to us in time to move to shelter. 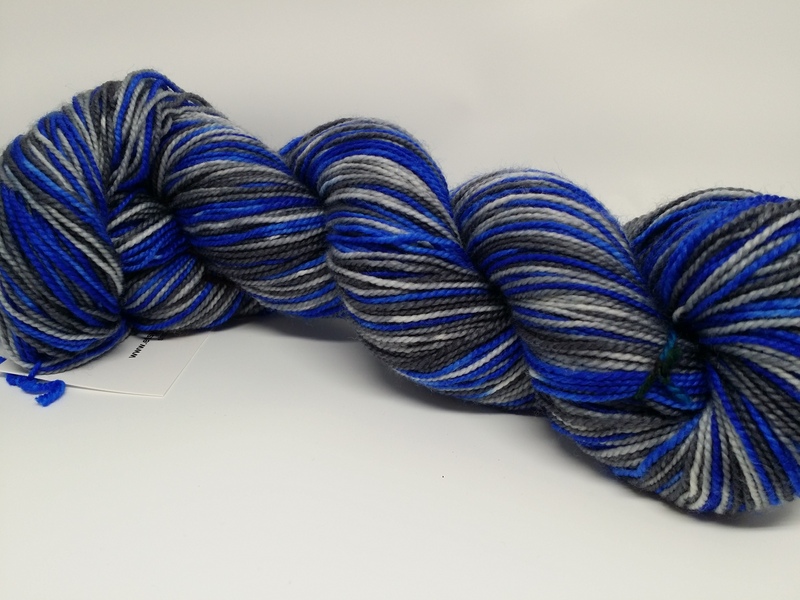 This self-striping yarn shows how dramatic the color shifts can be, and just like that are back to blue skies again. Part of the Springfield Botanical Gardens, the Mizumoto Japanese Stroll Garden is a beautiful park to spend an afternoon in with family and friends. This lovely park with traditional Japanese garden landscaping includes a large Koi lake, a moon bridge, a meditation garden, and a tea house. Filled with Dogwood Trees (our favorite ;D) and Cherry Trees the ground in the spring is covered in pink and white blossoms. With delicate pinks, creams and greens this colorway is a journey through the stroll garden in the spring. A major attraction in Branson, Missouri is the Show Boat Branson Belle a large paddle wheel boat that takes its passengers on a tour of Table Rock Lake and includes a wonderful dinner with a fun floor show. While on this majestic river boat strolling on the deck you can watch the sun setting with an explosive array of oranges and pinks that repeat in the glistening water around you giving an other worldly effect, a truly amazing sight if you can catch it just right. Just in case you can’t make it to the showboat, take a bit of that sunset with you in this bright and vibrant yarn. It’s springtime in the Ozarks and that means its time to pay careful attention to the weather man and that colorful Doppler Radar map. You never know when that springtime storm is going to turn bad and become a tornado and it be time to TAKE COVER! This colorway was inspired by all those bright and warning colors on the Doppler Radar and how they all wrap around each other. The bright and warning red and orange surrounded by bright blues and greens. Hippity Hop, Easter’s on It’s Way! 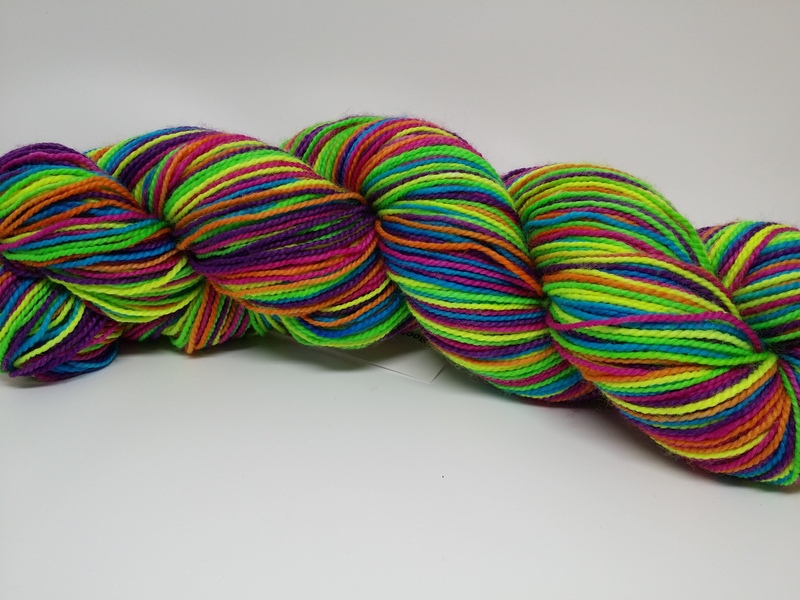 This colorway is a basketful of goodies just like the one the Easter Bunny will leave for you Easter morning! Lots of bright green Easter grass full of spring colored candies! Thank (or Blame) the Easter Bunny for this delightful yarn that ends up in your Easter Basket this year. Possibly the most famous Missouri outlaws are the James Brothers, with their base in the Missouri Bootheel they ravaged the country from North to South. With bounties on their heads and posse’s trailing behind they galloped their way into history and the notorious legends were born. This colorway invokes the horse ridin’, bank, train and stage coach robbin’ boys with dust covered boots and six shooters on their sides riding like the wind to their secret hideout. So follow them and take off for your own secret hideout and escape with this treasured yarn. We may be landlocked in Missouri, but that doesn’t mean that we don’t dream of tropical vacations like everyone else. From the bright colors of exotic flowers and birds, to the greens of palm fronds rustling in the trade winds, the hues in this colorway will tide us over until we get on the plane for our next vacation. Jem is excitement, Ooh ooh Jem, Jem is adventure, Glamour and glitter, fashion and fame, Jem! If you recognize those lyrics then like us you are a child of the 80’s when wild bright colors dominated our wardrobes and a Truly Outrageous cartoon super hero/rock-star and her awesome band the Holograms were a must watch show. Rekindle that 80’s wild child with some glitter and glamour and be TRULY OUTRAGEOUS! When you think about vineyards like most people you think about Martha’s Vineyards in California and all myriads of wineries along the west coast. But did you know that Missouri is wine country too. There are wineries spanning the state including: Meramec, Hermann, Nevada, Camdenton and Independence. Just about 30 minutes away from Springfield you can tour a dozen wineries in the Branson area as well. This colorway is a tribute to all those lovely grape vineyards. With a very rich dark purple, beautiful greens of the vines and a soft neutral color like the wood of the older plants.